Determining the poverty line is usually done by finding the total cost of all the essential resources that an average human adult consumes in one year. The largest of these expenses is typically the rent required to live in an apartment, so historically, economists have paid particular attention to the real estate market and housing prices as a strong poverty line affector. Individual factors are often used to account for various circumstances, such as whether one is a parent, elderly, a child, married, etc. The poverty threshold may be adjusted annually. Access to services: This item is undefined by Gordon, but normally is used to indicate the complete panoply of education, health, legal, social, and financial ( credit) services. A traditional list of immediate "basic needs" is food (including water), shelter, and clothing. Many modern lists emphasize the minimum level of consumption of 'basic needs' of not just food, water, and shelter, but also sanitation, education, and health care. Different agencies use different lists. In 1978, Ghai investigated the literature that criticized the basic needs approach. Critics argued that the basic needs approach lacked scientific rigour; it was consumption-oriented and antigrowth. Some considered it to be "a recipe for perpetuating economic backwardness" and for giving the impression "that poverty elimination is all too easy". Amartya Sen focused on 'capabilities' rather than consumption. In United States, the poverty thresholds are updated every year by Census Bureau. 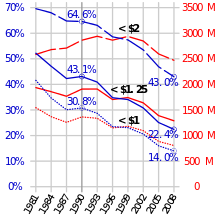 The threshold in United States are updated and used for statistical purposes. In 2015, in the United States, the poverty threshold for a single person under 65 was an annual income of US$11,770; the threshold for a family group of four, including two children, was US$24,250. According to the U.S. Census Bureau data released on 13 September 2011, the nation's poverty rate rose to 15.1 percent in 2010. ^ a b Richard Jolly (October 1976). "The World Employment Conference: The Enthronement of Basic Needs". Development Policy Review. A9 (2): 31–44. doi: 10.1111/j.1467-7679.1976.tb00338.x. ^ Dharam Ghai (June 1978). "Basic Needs and its Critics". Institute of Development Studies. 9 (4): 16–18. doi: 10.1111/j.1759-5436.1978.mp9004004.x. ^ Callan, T.; Nolan, Brian; Whelan, Christopher T. (1993). "Resources, Deprivation and the Measurement of Poverty". Journal of Social Policy. 22 (2): 141–72. doi: 10.1017/s0047279400019280. hdl: 10197/1061. ^ Keister, Lisa A.; Moller, Stephanie (2000). "Wealth Inequality in the United States". Annual Review of Sociology. 26 (1): 63–81. doi: 10.1146/annurev.soc.26.1.63. ^ "Basic Statistics". Talk Poverty. Retrieved 2019-04-01. ^ Winchester, Hilary P. M. (1990). "Women and Children Last: The Poverty and Marginalization of One-Parent Families". Transactions of the Institute of British Geographers. 15 (1): 70–86. doi: 10.2307/623094. ISSN 0020-2754. ^ a b "Single Mother Statistics". Single Mother Guide. 2012-03-23. Retrieved 2019-04-01. ^ "U.S. Poverty Statistics". federalsafteynet.com. Retrieved March 23, 2019. ^ "The Faces of Poverty". USA Today. Retrieved March 20, 2019. ^ "U.S Poverty Stats". Retrieved March 23, 2019. ^ "U.S. Poverty Staistics". federalfasteynet.com. Retrieved March 23, 2019. ^ "United States Population". worldpopulationreveiw.com. Retrieved March 1, 2019. ^ a b c d e f g h i j Engle, Patrice L.; Black, Maureen M. (2008). "The Effect of Poverty on Child Development and Educational Outcomes". Annals of the New York Academy of Sciences. 1136 (1): 243–256. doi: 10.1196/annals.1425.023. ISSN 1749-6632. ^ a b c d "Poverty Guidelines". ASPE. 2015-11-23. Retrieved 2019-04-01. ^ a b c "Federal Poverty Level (FPL) - HealthCare.gov Glossary". HealthCare.gov. Retrieved 2019-04-01. ^ a b c d "Will you receive an Obamacare premium subsidy?". healthinsurance.org. 2018-12-27. Retrieved 2019-04-01. ^ a b c d "Research Update: Medicaid Pulls Americans Out Of Poverty, Updated Edition". Center For Children and Families. 2018-03-08. Retrieved 2019-04-01. ^ a b c d Griffith, Kevin; Evans, Leigh; Bor, Jacob (2017-08-01). "The Affordable Care Act Reduced Socioeconomic Disparities In Health Care Access". Health Affairs. 36 (8): 1503–1510. doi: 10.1377/hlthaff.2017.0083. ISSN 0278-2715. ^ a b Grieger, Lloyd D.; Danziger, Sheldon H. (2011-11-01). "Who Receives Food Stamps During Adulthood? Analyzing Repeatable Events With Incomplete Event Histories". Demography. 48 (4): 1601–1614. doi: 10.1007/s13524-011-0056-x. ISSN 1533-7790. ^ Kenworthy, L (1999). "Do social-welfare policies reduce poverty? A cross-national assessment". Social Forces. 77 (3): 1119–39. doi: 10.1093/sf/77.3.1119. hdl: 10419/160860. ^ Bradley, D.; Huber, E.; Moller, S.; Nielson, F.; Stephens, J. D. (2003). "Determinants of relative poverty in advanced capitalist democracies". American Sociological Review. 68 (3): 22–51. doi: 10.2307/3088901. JSTOR 3088901. ^ Matt Levin (October 2, 2017). "Expensive homes make California poorest state". San Francisco Chronicle. p. C1.